If you have been coloring pictures with colored pencils for a while and think that the colors used appear somewhat dull on the paper, Here’s a simple technique that may help you get better results. How did I create this picture? I am by no means an expert in coloring. However, I just like to experiment with colored pencils and markers to see the different types of results I get. If you are just starting out in coloring, I suggest that you do not think too much about what colors to use or whether to color with pencils or markers. As you color, you may find that some pictures may not come out the way you thought it would, or you made a mistake and used the wrong color. The most important thing is to not quit; just keep going–you may be surprised at the result. The hardest part of coloring is just getting started. Outlining with marker and then coloring the inside of the object with pencil is brilliant. I love coloring and have found it, surprisingly, relaxing! Who would have thought being an adult that this could provide some much needed stress relief?? I also appreciate you mentioning that getting started is the hardest, and to keep going regardless. I feel as adults we can be perfectionist and overthink things entirely too much. Sometimes, we just need the push to start and the rest is history. I’m glad that you liked my idea of outlining pictures with markers and coloring the inside with pencils. 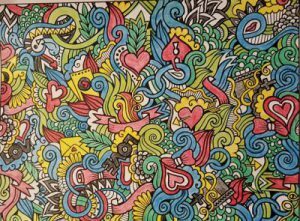 Since I have started coloring, I am always experimenting with using different combinations of coloring utensils–markers/pencils, markers/crayons, etc. There have been many times I have started coloring a picture and did not like how it was coming out. However, I did not quit and kept coloring and ended up liking the finished result. I agree with you that we as adults sometimes think too much about things. I find myself doing this when choosing how I want to color a picture. The colors represent life, joy, and happiness for my soul. I love shirts and ties with different colors. I was surprised to see you applying different colors in your video. It definitely stands out much more when you use markers and pencils. I have made your post very happy thank you very much! I am glad that you liked my post. I was unsure whether or not to start this website because I did not know how interested people would be in this subject. That’s my biggest fear. I added the video because I thought it would be more effective in getting my points across. Thanks for commenting. I love the idea of mixing markers with pencil crayons… it does really make the edges pop a bit more! My 4 year old daughter loves to color, and ALWAYS wants me to be with her. My Mom knew this, so she bought me an adult coloring book for Christmas last year so I could color something more “fun” than Disney princesses. At first I was skeptical, but in truth, I have been enjoying it! Next time we have a coloring session, I might give your idea a shot! I’m glad that you have found coloring to be enjoyable. I was skeptical too when I first started, but I now find coloring very relaxing. In regards to coloring by mixing markers with pencils, I sort of discovered this by experimentation. I had no idea of what the results would be and I was pleasantly surprised how well the picture came out. By all means, try it–let me know how it turns out! My kids just finished your article and loved it. They were searching online for coloring tips and came across your site. I was coloring with them the other night when this very topic came up. I showed them how to color the way my grandfather taught me. He would outline everything with a black crayon and color everything inside with other colors. Exactly the same technique you are teaching. The kids said thank you for the coloring tips.